SpaceX could take its prototype Mars-colonizing spaceship out for a spin very soon. The flight-test version of SpaceX's Starship vehicle could be ready to take its first short "hopping" excursion in a matter of weeks, company founder and CEO Elon Musk said over the weekend. Musk also tweeted an illustration of the test vehicle, showing a three-finned ship that looks a lot like the rocket the comic-book character Tintin used in the 1954 adventure "Explorers on the Moon." "Starship test vehicle under assembly will look similar to this illustration when finished. Operational Starships would obv have windows, etc.," Musk tweeted. 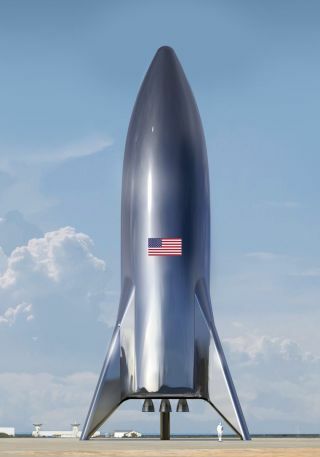 The first crewed Red Planet mission for the rocket and 100-passenger Starship could come as early as the mid-2020s if development and testing go well, Musk has said. This work is taking place at both SpaceX headquarters in Hawthorne, California, and the company's test site in South Texas, near the border city of Brownsville. Indeed, the hopper flights will take off from this latter facility. Hoppers are a standard part of SpaceX rocket development. For example, the company flew Grasshopper test vehicles in 2012 and 2013, to gain the expertise needed to land and re-fly Falcon 9 first stages. The highest Grasshopper flight reached a maximum altitude of about 2,500 feet (750 meters).